There are so many great places and here I go complaining. My errands took me OTP yesterday. OTP is Atlanta shorthand for "Outside the Perimeter" outside of I-285, Atlanta's perimeter highway. It's was unfamiliar territory to me so I took the scenic way back. I focused on an 11.1 mile stretch, a state highway. It's now an inter-suburb 4-laner, a quick, safe road with synchronized signals. Housing didn't collapse here. It's still on the make. Things are new. Some suburbs were ruined in the downturn but not this one. I don't expect shopping centers, strip malls, tire dealers, restaurants, schools, recreation centers, office parks or even subdivisions to be noteworthy. They are efficient and efficiently built, whether in Georgia, Ohio or California, urban or suburban. I pay them no attention whatsoever. I crave landmarks, something different. In this prosperous place the old farmhouses, barns, and quaint little churches are gone. So the new churches are the only hope for landmarks. But they aren't so hot. The landmark city churches are pre-WW1, pre-Depression, and post-WW2. You can't build them like that today except in centers of great wealth. New churches are on a budget in the middle of parking lots. They are modern or pomo abstractions of classic churches. New city churches would look the same if they were actually building new city churches. So these 11.1 miles are just a place to get through. Architecture tourists go sightseeing on Murphy Avenue. It's part of the industrial corridor that borders Fort McPherson, Sylvan Hills, Adair Park, West End. By and large, they made the street fronts attractive. Folks are repurposing many of these sturdy buildings. This is Bella Cuccina corporate HQ. I wonder if Atlanta Time Machine can find a picture of this in it's prime. This ruin fronts nine acres. There are some storefront churches. This could be anywhere in Georgia. If you are here at the right time, there are yummy smells. Lifecycle Building Center lives here, they recycle building products and you can follow them on Faceboook. Amazing. Tax records say this was built in 1966. It's on 3 acres. There's much more to Murphy Avenue. Want to tour Murphy? Let's go. I had my eye on two for May 19, two special houses I never expected to see. I wish you could see for yourself. I doubt they'll be open again. Super Sundays are for house loving architecture tourists. Asking $270/sf: I knew this one to be designed David Fowler. It's tucked into the landscape, on a nearly hidden lot. But once it caught my eye, I found treasure. Built 2005, 4,422 square feet, on 0.2355 acre. Asking $275/sf: The small one was on my street, a corner house. It had been abandoned for years. Someone renovated it into a gem of a not-so-big house. Then it found the best owner possible who made constant improvements to house and landscape. Built 1948, 2,018 square feet on 0.201 acre. By the way, I think this had a contract within a couple of days. I loved the kitchen entry on the big house. I loved the kitchen entry on the not-so-big house. I loved the phantom awning. A 65 year old house is entitled to it's age marks. Perhaps awnings will make a comeback. This is the big house's backside. It has windows and porches and balconies to suit everybody. Unless you look closely you don't notice the precise recessed pointing. But the eye notices a difference. You catch a bit of shadow and of white on each header face and arris (corner edge), a layered look, like showing a bit of petticoat. This square bay window and dovecote are new additions. The window rocks inside and out. Let me mention one more thing. Both houses were bright inside. They seemed narrow and made me think of "Wings of Light." It had suffered a hippie-renovation and was prime Midtown Atlanta teardown bait. On the eclectic Charles Allen Drive the new house could make a statement yet fit right in. Go see for yourself, my pictures don't capture it, don't capture how good it is in context. It makes the street better. I've driven by 100's of times over decades but I never got used to it. The old house became an unlovable landmark. This is the house to the left, not in showroom condition but impressive. 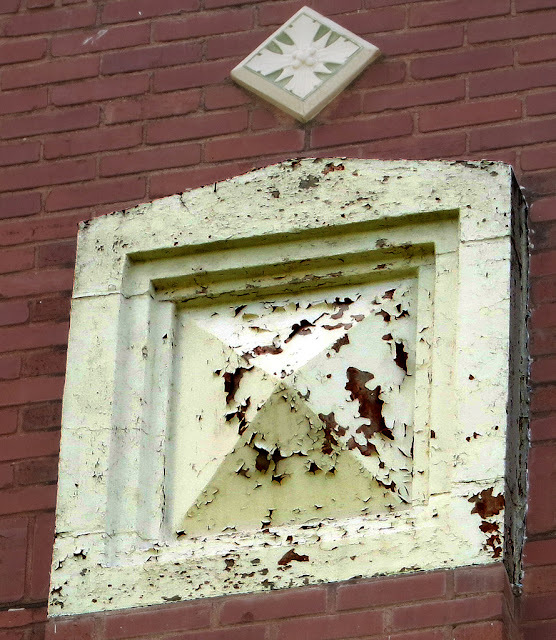 Tax records show this one was built in "1920," a contemporary of the teardown. The hippie-modern renovation might have been very cool in it's day. They tore it down and it sat and sat with this too-cute sign. We forgot about the old house. Then Brian Ahern (left) and Jeff Darby (right) got hold of it. See more about another house by Brian and Jeff. They don't do craftsman. They do modern spec houses that sell before they are finished. A breath of fresh air at 3,705 square feet. Would this fit on your street? Mmmm.... gravel and squarish rock chunks. Go see and enjoy Charles Allen while you are at it. And find the Virginia Tech Modern while you are there. I'll tell you my Charles Allen Drive love story another time. They don't need this 835 foot smokestack any more. But I hate losing a landmark. 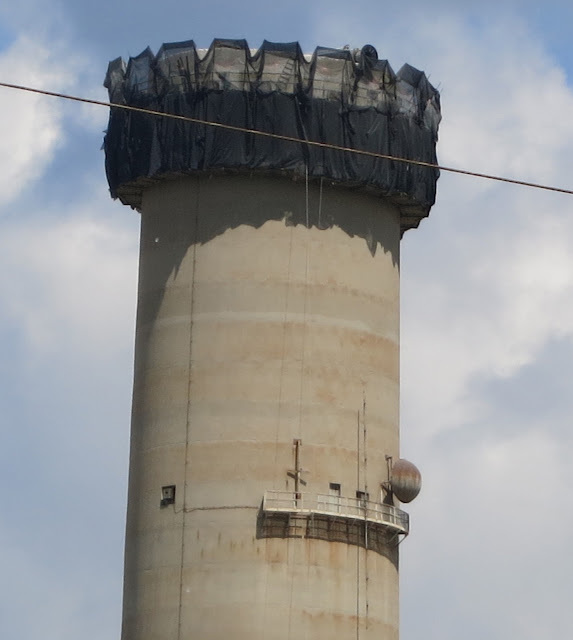 Georgia Power is converting Plant McDonough-Atkinson from a coal-fueled electric generator to a natural gas-fired generator. The two coal units, 1 and 2, have been retired. They ruled out imploding it so they are taking it down chunk by chunk. IT WAS TALL. Can you imagine working on that little balcony? But it sits on low ground, on the north bank of the Chattahooche. The elevation at its base is about 780' above sea level. In contrast, the base of 191 Peachtree is about 1,080' above sea level. There's almost no place where you can see it from top to bottom. I took this picture from Paul Avenue. Unless you live in Smyna, or commute on South Cobb, or drive the NW section of I-285, you might have never seen it. It illudes. It appears suddenly, a Zen View. It pokes up from the landscape inaccessible and alone. Does it look safe up there? I'll bet it's noisy, demolishing concrete and steel, ahh but the view. 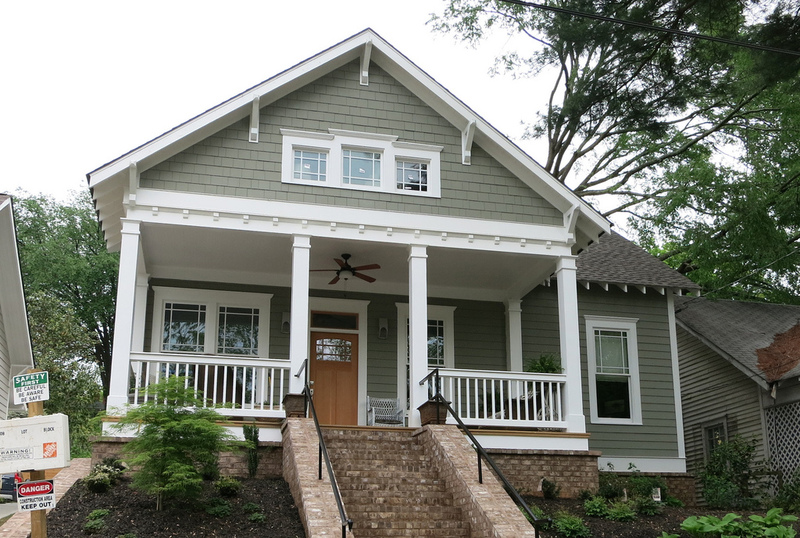 A teardown in Inman Park. Are you kidding? When we dream, we talk Ansley Park, Candler Park, Peachtree Hills, Morningside, Midtown, Virginia Highland, Oakhurst, Kirkwood, Winona Park, MAK. 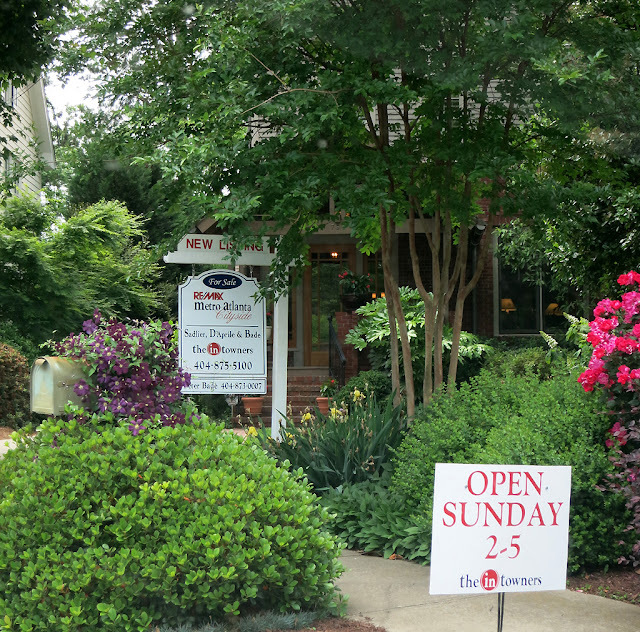 In the end it's always: "We want to live in Inman Park." But there's isn't room for all of us. Property records say the old house was built in 1917, 1,603 square feet on a 0.11 acre lot. The new house was designed by Adam Stillman Residential Design, built by Cablik Enterprises, the building permit shows 2,302 square feet. 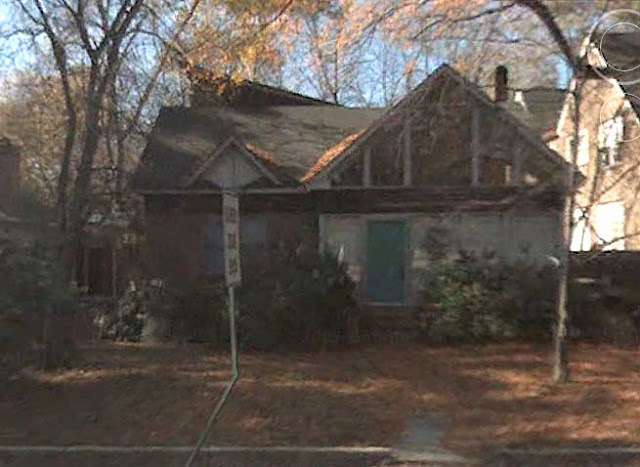 This is a stunningly small house by today's intown teardown standards. But it fits. At nearby 836 Euclid they are building 4,162 square feet on .2 acre, but it also fits. The old house was blue and boarded up. It was embedded in the vegetation and in the context of the street. It's the house on the left. There wasn't a driveway. The houses seem like a mass planting, growing together. This is an "old" look. You just can't do a new house without a driveway so the new house is narrower to accommodate it. On this hill the driveway requires these abrupt retaining walls. It's a startling effect but landscaping will soften them over the years. ...this is pretty darn good and better in person. It's within sight of this infill which also had to fit. When Atlanta boosters meet in a great building, there's cake, AND they tell me about it, I'm there! It was the Hypepotamus Founders Day Party yesterday. Inside these doors you can find: Xiaohang Li, entrepreneur at XQUVA. Hypepotamus is a year-old start-up incubator. They provide free co-working space in the basement of the Biltmore. They supply massive amounts of energy. They are one of my Atlanta-booster heroes. Here's the Biltmore. It's the terminating vista at the corner of 5th and West Peachtree. It anchors the eastern edge of Georgia Tech's "Tech Square." It's a brick escarpment with offices, apartments, condos and Hypepotamus. The two ballrooms are on the piano nobile. This is the Imperial Ballroom on the south end of the Biltmore. The Hypepotamus space is below. By the time I got there, the cake was gone, the fist-sized meatball sandwiches were running low, and they were making another keg run. The crowd paid no attention, except maybe to the beer. Cool room. As you walk down the ramp, you see the Polariod field guide. These folks can use this space for free and they get a lot for their money. Entrepreneurship is not a field for the shy wallflower. Hypepotamus provides the space, the energy, the activities, and the networking to "give shy people the courage to do what needs to be done." Entrepreneurs have to sell. Hypepotamus makes you practice. Entrepreneurs have to promote, they have to be ready to talk. Entrepreneurs have to give interviews. Hypepotamus manager Scott Henderson conducted video interviews all through the party. See your city councilman? Where's Kwanza? Even I was feeling like an entrepreneur, like an angel investor. There's no avoiding the energy in this place. After two hours folks were still arriving, the place sill buzzing. But it was time to return to work as Architecture Tourist. I am totally fascinated by the floor. What was this space in 1924? Herringbone wood, bordered in marble, framed in tile? A bar, a restaurant, with a dance floor? I must see the Georgian on the way out. The Georgian Ballroom that is. And I enjoy the giant "Woman Holding a Balance." It warms up the marble-modern lobby. Thanks Hypepotamus. Thanks for talking with me: Chris, Scott, Stephen, Jane, Melody-Rose, Xiaohang Li, Valerie, Tolen. Thanks Kevin Wallace and Heath Hyneman for Hypepotamus.